On my days off from work, there is nothing better than walking around the farmers’ market. Especially if Ryan is in town and I get to drag him with me. My favorite market is in Lippit Park here on Saturday mornings and really has become a community event. There are tons of fruit and vegetable vendors, meat and cheese producers, and even food trucks (my fav!). I love every part of it. I went last week with the idea of getting a bunch of vegetables for the week. Food at the baseball field doesn’t include many green things, so I normally make vegetable side dishes when Ryan is in town to supplement dinner. Instead of spreading the veggies throughout the week, I ended up combining everything into this raw and roasted veggie-fest. I love the combination of textures, tastes, and temperatures. Everything you love about summer, simply prepared, for a delicious side dish. Cut the zucchini into 1/2 inch round slices and the yellow squash in half, and then into quartered spears. Drizzle lightly with olive oil, season with salt and pepper, and roast in the oven for about 15 minutes, or until they start to brown. 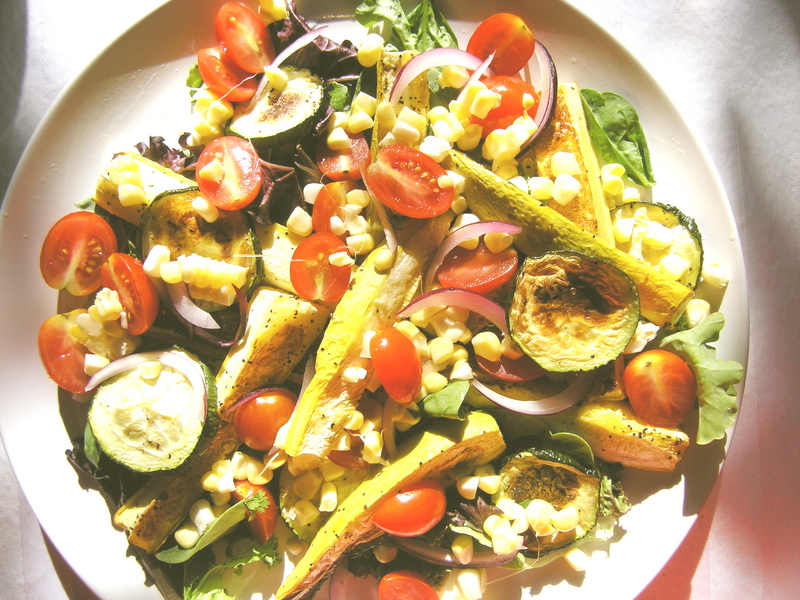 While the squash is cooking, prepare the dressing by whisking all of the ingredients together in a small bowl. Cover and keep at room temperature until serving. Use a knife to remove the corn kernels and to cut the cherry tomatoes in half. Thinly slice the red onion and lightly toss everything together. When the squash is out of the oven, assemble the salad by layering the mixed greens, cooked vegetables, and then raw vegetables. Whisk the dressing and lightly drizzle over top before serving.